I recently realised that I live in a city with rather remarkable Roman roots. 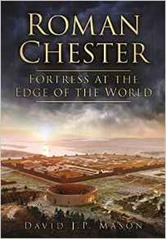 Having read Mary Beard’s book, SPQR, about the Roman’s in Rome, I turn now to Roman Chester: Fortress at the Edge of the World by David J.P. Mason. The book starts with a chapter on the origins of the study of the Roman origins of Chester, and some background on Roman activities in Britain. The study of the Roman history of Chester begin back in the 18th century, with the hypocaust under the old Feathers Inn on Bridge Street a feature promoted by its owner. The Spud-u-like on the site now similarly boasts of its Roman remains. The original Roman east gate was still standing in the 18th century, and there exist several drawings of it from that period. The Victorians were keen excavators of the Roman archaeology, and formed the Chester Archaeological Society in 1849, and built the Grosvenor Museum in 1883. A recurring theme of the book is the rather wilful destruction of substantial remains in the 1960s to build a couple of shopping centres. The Roman remains on the current Forum Shopping Centre site were destroyed after the rather fine Old Market Hall had been knocked down. The core Roman activity in Chester was the fortress, established in 75AD under the reign of Vespasian. The fort is somewhat larger than other similar forts in England and the author suggests this was because it was, at one time, intended as the provincial governors base. Vespasian died shortly after the building of the Chester fortress started and the work paused. At the time of its Roman occupation Chester had a very fine harbour, the local sandstone was suitable for building, a brickworks was setup at Holt, further up the River Dee, and there was metal mining in North Wales and there was salt sourced from Northwich – all very important resource at the time. Standing on the river Dee meant Chester could serve as a base for the further conquest of Britain and Ireland – although these plans did not come to fruition. The evidence for this is some unusual buildings in the centre of the old fortress, and the rather more impressive nature of the original walls than the average Roman fort, and the discovery of rather classier than usual lead piping. The book continues with a detailed examination of the various parts of the Roman fortress and the buildings it contained: the public baths, granaries and barracks. This is followed by a discussion of the surrounding canabae legionis, including the amphitheatre, the supporting Roman settlement and the more detached vicus. This includes the settlement at Heronbridge which was excavated relatively recently. The third part of the book travels through time, looking at the periods c90-c120 in which the fortress was rebuilt, c120-c210 when the legion stationed at Chester was sent elsewhere to fight leaving the fortress to decline significantly. c210-c260 when the original impressive buildings at the heart of the fortress, not initially completed, were finally built. c260-c350 when the fortress fell and rose again. To finish in the period c350-c650 when Britain became detached from Rome, and fell into decline. The Roman fortress was robbed to provide building stone for the medieval walls and other structures including the cathedral. Roman remains are visible throughout modern Chester. The north and east parts of the modern city walls follow the line of the walls of the Roman fortress. Some pillars are on display in front of the library, the hypocaust found under the Grosvenor shopping centre can now be found in the Roman Gardens, the amphitheatre is half exposed, parts of the walls particularly near Northgate and parallel to Frodsham street are contain Roman elements, the mysterious “quay wall” can be found down by the racecourse. The book finishes with some comments on the general character of the investigations of Roman remains in Chester, and suggestions for further investigations and how to better exploit Chester’s Roman history. On the whole Chester has done moderately well in its treatment of the past, study started relatively early but much material has not been published. These days archaeology is mandated for new developments in the city but these tend to be rapid, keyhole operations with little coherent design. Roman Chester is a rather a dry read, it is written much I would expect an article in a specialist archaeology journal to be written. The book could have done with a full double page map of modern, central Chester with the archaeological sites marked on it. As it was I was flicking between text descriptions and Google Maps to work out where everything was. Perhaps a project for the Christmas holiday! If you are a resident of Chester then the book is absolutely fascinating. I’ve started making a map of Roman Chester on Google Maps.